Applicator Magazine is a technical journal, published five times a year which contains articles on application, techniques and problems in the sealant, waterproofing and restoration industry. The Clear Water Repellent Field Manual has all the same information as the larger manual, but is reformatted to a smaller bound manual for your foreman or anyone in the field to easily use! 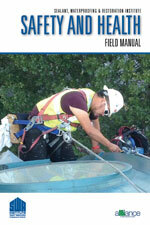 Make sure you have this handy on-site field manual available for education about clear water repellents anytime! Information on clear water repellent materials for both vertical and horizontal surfaces. Also included are a glossary, product comparisons, specifications, monograph and performance test criteria. The Clear Water Repellent Manual is a source of un-biased information that can make sense of a topic that is often either oversold or misunderstood. The Safety and Health Field Manual is a comprehensive, user friendly, simple, easy to read, short and "to-the-point” publication produced for the field workers in building, restoration and waterproofing trades. Please select appropriate language (English or Spanish) from the drop down below. The 2013 revised edition covers all aspects of sealants and their use in the building process.